View cart “Magnesium” has been added to your cart. Beyuna Magnesium is contained in a vegetarian capsule. Beyuna Magnesium is of pure, high quality and is 100% natural and GMO-free. Beyuna adheres to the “clean label” principle, which means that the supplement does not contain fillers, additives or colourings. Magnesium is good for the muscles and contributes to the normal functioning of the nervous system. In addition, magnesium helps maintain energy levels and contributes to the reduction of tiredness and fatigue. Magnesium is also good for the concentration and helps to maintain healthy bones and teeth. A dietary supplement is not a substitute for a balanced diet. Keep container tightly closed in a cool and dark place below 25ºC and out of the reach of young children. 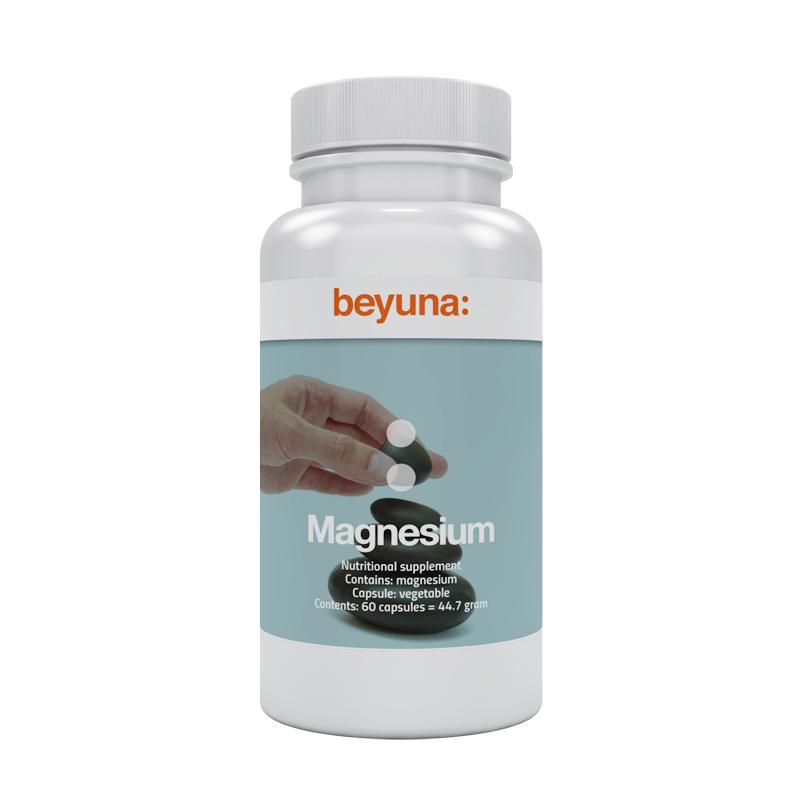 Based on various scientific studies, Beyuna has selected a number of magnesium types that are well absorbed by the body. Beyuna adheres to the Clean Label principle, which means that the supplement does not contain fillers, additives or colourings. Beyuna Magnesium is in a vegetable capsule. Beyuna Magnesium is of pure, high quality and is 100% natural and GMO-free. There are different types of magnesium available that vary in absorbability. A pure mineral such as magnesium cannot be absorbed by the body, but requires an additive. Absorption therefore relies on the additive linked to the magnesium. Beyuna has looked at the best additives that are bound to magnesium to ensure optimum absorption, also known as the bioavailability of a substance. The elemental content says something about the amount of 'pure' mineral that the supplement contains. Beyuna uses only organic substances as additives. The numbers after magnesium in the list of ingredients are the amounts of elemental magnesium per compound. For example in the compound ATA magnesium, the compound consists of 16.25 mg of elemental magnesium. Unfortunately, the RDA refers to elemental magnesium and does not consider the compound and the level of bioavailability.